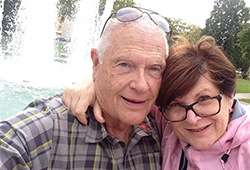 Although James and Andrea French moved from the ice and snow of Colorado to the sunny retirement community of Laguna Woods, it didn't mean they were going to do anything leisurely. In fact, the Frenches are busier than ever. James works as an aerospace engineer consultant for Blue Origins, Jeff Bezos' company that is spearheading private space flight. Andrea, who had a long career in education, retiring as a school superintendent, plays bridge four to five times a week and travels to competitive tournaments all over the country. The couple also spends plenty of time with their grandkids, takes exotic trips, ventures out to new restaurants, and calls themselves film buffs. While their schedules are packed and they seem to be jetting off from here to there, James and Andrea know how critical it is to have excellent health care close to home. After learning about MemorialCare Saddleback Medical Center's plans to reconfigure space within the hospital for efficiency and add more private rooms, the Frenches made a gift in the form of a charitable bequest. "We believe it's important to support the programs that are of value to you and your family and the causes that make the community a better place," said Andrea. "That's why we chose to make a contribution to Saddleback Medical Center." The Frenches are paying it forward to not only impact their own care but also to leave a legacy for other patients in the future. "We've been very impressed with our doctors, and so we wanted to get involved in a positive way."